ISTANBUL: Yasmin Rostomyan makes no big outward show of her origins but works daily to keep her Armenian heritage alive and preserve it for the future in modern Turkey. Yasmin is one of around 60,000 Turkish-Armenians who form modern Turkey’s Armenian community and have remained in the country despite the long shadow of history. The modern state of Armenia and the diaspora allege that 1.5 million Armenians were killed in the first genocide of the 20th century from 1915 in a targeted Ottoman campaign to wipe them out of eastern Anatolia. Turkey angrily denies that the Ottoman authorities committed genocide and says hundreds of thousands of Muslims and Christians were killed in a shared wartime tragedy. The modern day controversy over World War I massacres — which is coming to a head before the 100th anniversary of the tragedy on April 24 — looms large of the small remainder of the Turkish-Armenian community. But in daily life they do everything to keep their culture and language intact, despite being a tiny Christian community in a majority Muslim country. Yasmin every day takes her children to one of the 20 Armenian schools that are run with approval of the Turkish education ministry and which have teaching in Turkish and Armenian. The playground resounds with the cries of pupils in both Turkish and Armenian, a symbol of the slow but noticeable lifting of taboos in Turkey. “We are very happy in this school, our children can learn our langauge, normally,” said Yasmin. “When my generation was growing up, it was more hidden, and we did not speak Armenian in the street. “But my father insisted that we took courses in the house and it was very important for him,” she said. The Karagozyan school respects the calendar of the Muslim and Christian religions and drawings marking Easter and still on the walls. “We have teachers in Turkish culture and we try to make our two cultures live together and we bring in the families,” said the school’s director Arsuvak Koc-Monnet. While the official community of Armenians is just 60,000 — mostly in Istanbul with tiny community elsewhere — the number of people of Armenian origin in Turkey is in reality far higher. Some of the so-called “Hidden Armenians” (or Crypto-Armenians) are slowly re-discovering their identity but for many it has been lost forever. The Rostomyan family, however, has not forgotten its roots or the tragedy of 1915. 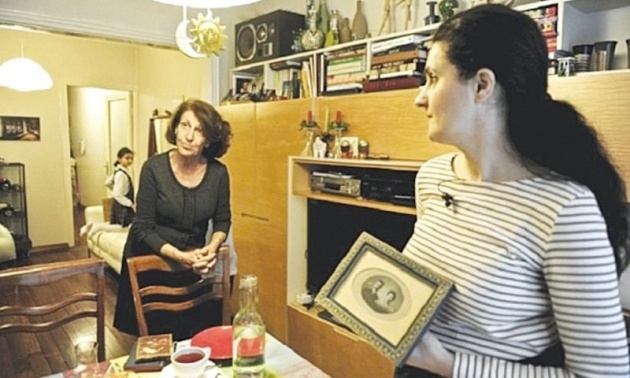 In her apartment, Yasmin shows the sepia picture of her great-grandfather who died that year and has pride of place on the dresser between the dictionaries. The word genocide does not exist in Turkish history books and using it to describe the killings can lead to legal action on charges of insulting Turkey. “We never heard the genocide spoken about when we were young, it was a great secret,” she said. “By hiding it, some people thought that you could pull a cover over it. “I understood later, during adolescence,” she added. Despite the crushing weight of this past, the Rostomyan family refused to emigrate, like many other Armenians. In the 1950s, the family left the northeastern region of Amasya close to the Black Sea for Istanbul and settled in the Bomonti district, which is also home to many Armenians as well as Greeks and Jews. “It’s quieter now. We have security,” she says, adding that she, nonetheless, tells her children to call her “Anne” (mother in Turkish) on the street rather than the Armenian version. She hopes that the April 24 anniversary will help Turks take steps towards accepting the reality of the events. But she has no illusions. “I expect nothing from states and from politicians but I expect something from my [Turkish] friends. Do Good and Get Good..